Walking is good for you. But did you know that brisk walking is one of the simplest and most effective ways to maintain a healthy mind, body and soul? Walking at any speed is good for you. But the real benefits kick in when you walk a brisk pace. The Centers for Disease Control and Prevention (CDC) defines brisk walking as a pace of more than three miles per hour or about 20 minutes per mile. The great thing about brisk walking is that you don’t need crazy equipment or an expensive gym membership to do it. All it takes is a serviceable pair of Nikes and thirty minutes a day to tap into benefits that will significantly improve your quality (and quantity) of life. 1. Brisk walking improves your circulation. Walking helps prevent heart disease by strengthening your heart and circulatory system. Studies show that women who walk just a few miles a day can reduce their blood pressure by more than 11 points in just six months. 2. Walking reduces back pain. A whopping 70% of Americans report occasional to frequent back pain. According to physicians, brisk walking may be the best way to reduce and eliminate your aching back because it releases serotonins and endorphins. It may hurt a little at first, but start slow and work through the pain. 3. It strengthens your aging bones. Your bones get brittle as you age. Walking helps prevent osteoporosis by building up the thickness of your bones, reducing the risk of hip fractures and other problems that happen as you get older. 4. You lose (a little) weight. Diet continues to be the most significant factor in weight loss. But when combined with diet, walking can contribute to weight loss. Every little bit helps and brisk walking for 30 minutes can burn up to 200 calories. 5. It’s good for your immune system. Tired of feeling sick and tired all the time? Walking may be the answer. A daily walking routine improves your immune system by generating T cells — the killer cells that attack infected cells in your body. 6. The risk of chronic diseases goes down. Diabetes. Heart disease. Stroke. Brisk walking decreases your risk for acquiring a variety of chronic diseases. By simply putting one foot in front of the other few a few minutes each day, you’ll feel healthier and live longer. 7. You feel less stressed. Walking releases endorphins and other chemicals that provide an emotional boost. It also gives you the opportunity to step away from the stack of work piled up on your desk. Your problems will still be there when you get back. But for a while, you’ll feel less stressed and more relaxed. When you walk around your neighborhood or community, you meet people — and that’s a good thing, especially if you spend the majority of your day in front of a computer screen. To ramp up the social aspect of brisk walking and hold yourself accountable for a daily walk, you might even want to invite a friend or family member to join you. 9. It makes you more creative. Some of the world’s most best thinkers and artists credit walking for helping them be more creative. 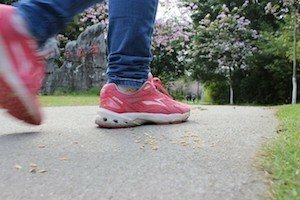 Although the link between walking and creativity isn’t completely clear, it appears to stimulate neurological pathways associated with the early stages of the creative process. 10. You can pray or meditate. A lot of us cite a lack of time as the main reason why we don’t pray or meditate. Walking creates space for prayer and meditation by removing the distractions of your work and personal life. With the right mindset, it’s possible to turn a daily walk into a spiritual discipline. 11. You experience the world. One of the most important benefits of brisk walking is that it forces you to get out of the house and experience the world around you. Whether you’re walking in nature or on busy city streets, you’re growing as a person because you’re having up close and personal interactions with your surroundings.